Location: Hotel RIU Pravets Resort is located in Pravets city at 70 km away from Sofia - easily accessible, only 45 minutes drive on Hemus highway. The hotel provides a quiet and cozy atmosphere for relaxation or work. 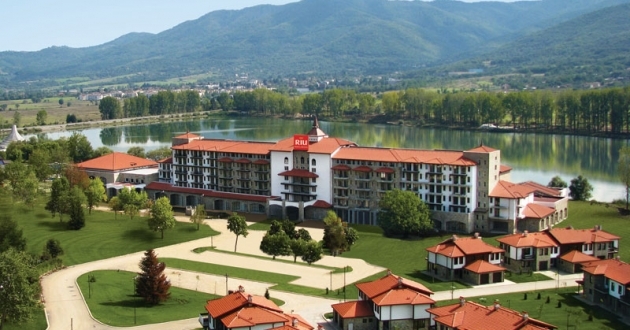 RIU Pravets Resort offers to its guests breathtaking views of the lake and the golf course, as well as the picturesque slopes of Stara Planina. Accommodation: The resort complex offers a total of 242 units - 212 standard rooms, 10 Studios and an Executive floor with 13 rooms, 4 One-bedroom and 3 Two-bedroom Suites. The standard rooms are equipped with bathroom, hair-dryer and cosmetics, direct dial telephone, internet, A/C, mini-bar, interactive television, pay TV, safe box in the room, work table, extensible chair bed, balcony, most of the rooms are with lake or golf course view, non- smoking rooms, rooms for disabled people. Executive floor premises offers: bathrobe and slippers, luxury amenities, one or two bedrooms, sofa bed in the suites, work desk, reading/work lamp, turn down service, lake or park view. Executive Lounge - exclusively for clients staying on the Executive floor: complimentary continental breakfast, snacks and beverages, complimentary magazines and daily newspaper. In the hotel: The two restaurants- Main and Gourmet offers a wide selection of culinary delights and quality drinks. On the hotel's premises there are also casino, Night Club "Shatra", open air Olympic-size swimming pool, conference center with a wide variety of fully technically equipped rooms (a capacity of 10 to 400 seats). Services: 24 hours room service, laundry, lobby bar, piano bar, spa bar, sun terrace, beauty salon, hairdresser, boutique, souvenir shop, wireless LAN zone (complimentary), business centre. SPA facilities: The wellness and SPA centre of the hotel covers an area of over 3000 sq. m. and offers great number of facilities and services: salt steam bath, herbal bath, salty water floatation tank, finnish sauna, laconium, lifestyle showers, ice room, russian sauna, hammam, caldarium and a cozy relaxation area with heated beds. A variety of traditional and exotic massages are performed by professional therapists. The fitness center is furnished with Technogym state of the art equipment. A 25 m long heated indoor swimming pool with a separate children's pool (30° C) are available for all hotel guests free of charge. Sports & Entertainment: the proximity of Pravets Sports Complex (with multifunctional sports hall, 3 football fields, 4 basketball and volleyball playgrounds and 3 tennis courts) is a great opportunity for camping and training of sport teams. The spot facilities available at the RIU Pravets Resort are: bikes, table tennis, billiards, tennis courts, tennis lesson available.